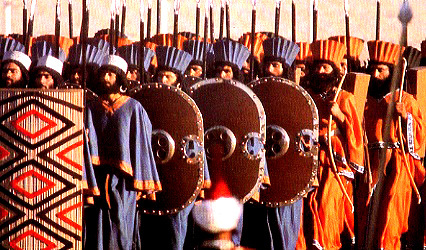 The Immortals were the heavy infantry unit of the Achaemenid Empire’s army. Also known as the first Persian Empire, the civilization was founded by Cyrus the Great in 550 B.C. in what is today Iran. The name ‘Immortals’ was coined by Greek historian Herodotus. What’s known about them mostly comes from his writing. Of course, if you know your history, or have seen the movie 300, you probably know that the Greeks and the Persians weren’t exactly fans of each other. So unfortunately, there is no way to know for sure if anything that Herodotus wrote was true. It’s also possible that there were no Immortal units and Herodotus confused the word Anûšiya (“companions”) with Anauša (“Immortals”). With that in mind, these are his accounts of the Persian Immortals. 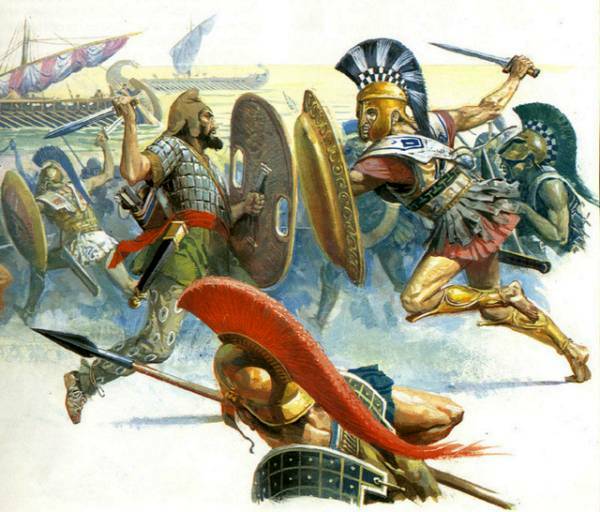 According to Herodotus, the Immortals always had 10,000 men in their unit. No more, and no less. If one died, or got sick, or something else went wrong, he was immediately replaced by another soldier. This gave the impression that the unit was full of immortal beings, because their numbers never dwindled. In order to become an Immortal, the warrior had to be Persian born and training started at an early age. When a space opened up in the Immortal unit, the leaders picked from the best soldiers from the lower groups of warriors, which were the Sparabara and the Takabara. Besides ranking below the Immortals, not much is known about either group. Compared to some of their enemies, like the Greeks, the Persians didn’t have the best weapons. While they did have scaled armor, they used shields made from wood and wicker, which wasn’t much help against something like the Spartans’ swords and spears. Instead of relying on the strength of their weapons, the Persians tried to intimidate their enemies with the sheer size of their army. Herodotus claimed that was 3 million strong under Xerxes. However, modern day researchers do not think that figure is anywhere close to correct. It was actually probably more like 70,000 infantry and 9,000 horsemen, which is still a massive number of soldiers. Also travelling with the army were caravans with concubines and servants that the Immortals were allowed to bring along with them. That would have made the advancing army look even bigger. Based on the size of their army alone, some cities surrendered upon seeing the Persian forces advance towards them. The training of Persian Immortals was difficult and started early. From birth, boys were kept separate from their fathers until the age of five. Then they would be taken to start their warrior training. It involved a wide range of skill development, including archery, fighting, and how to live off the land. They practiced standing guard, they trained for arduous marches, and finally every Persian boy in training needed to know how to tame a wild horse. They would enter military service when they were 15-years-old and remain a soldier until the age of 50. Then they could finally retire, providing they lived that long. Once they entered military service, they either became foot soldiers or cavalry. It wasn’t a permanent placement, as the most skilled veterans were able to serve in both units. The soldiers were also trained in both archery and hand-to-hand combat, which maximized the effectiveness of their already overwhelmingly massive army. A big problem with the Persian army was the logistics of moving everyone. Sometimes that meant the soldiers had a lot of downtime. So what did they do to pass the time? How about hunt lions, panthers, and cheetahs? What’s interesting is that the Immortals were allowed to bring caravans with them on their travels. These caravans were full of food, so they didn’t hunt the big cats because they were hungry. Instead, hunting the big cats was a form of practice that kept their battle skills sharp. They also would have used the skins to decorate their caravans and their uniforms. The skins would be a sign of the Immortal’s bravery and skill. Since these hunts were so dangerous, they were usually only performed by high ranking Immortals. While the Persians’ weapons didn’t help them win their wars against the Greeks and the Macedonians, one definite advantage the Immortals’ weapons had over enemy forces is that most of their weapons were versatile and could be used on horseback. This would make their light weapons incredibly dangerous. On horseback, it would allow them to get more force behind their blunt force weapons and their razor sharp spears. Another innovative way that the Persians used their cavalry was scythed chariots. Scythed chariots were invented in the early days of the empire and was used all the way up until its downfall in 330 B.C. The scythed chariots were tall, so only a small part of the driver was exposed above the rim. Attached to each axle were two-foot-long iron blades that spun, cutting through an enemies’ legs. It wasn’t a clean cut, either. The blades churned and ground through the skin, muscle, nerves, and bones of the legs. Besides chariots and men on horseback, the Persians used camel riders. In one battle, they brought 10 war elephants with them, but not much was written about their animal war unit. By the way, “Animal War Unit” sounds like either a great name for a metal band or a new hit procedural on CBS, doesn’t it? The weapon predominantly used by the Immortals was their spears. They were often six feet long with a razor sharp bronze or iron broad leaf-style spearhead at one end, and a metal counterbalance at the other. This counter balance was also used as a blunt force weapon. Often these counter balances were in the shape of fruit and denoted rank. The most common was pomegranates. However, the 1,000 most elite of the Immortals had an apple counterbalance. These “Apple Bearers” were the bodyguards of the Emperor. These soldiers were the best warriors, chosen from the most elite military unit, in the biggest army in Ancient history. They guarded the palace and their spears were much longer, about six-to-eight feet long. If the Emperor left the palace, they completely surrounded him. This made him nearly impossible to reach, thus guaranteeing his safety. Most of the Immortals’ weapons were fairly lightweight, which did have its downside. But one major benefit is that it allowed them to carry multiple weapons at once. Foot soldiers carried at least a short sword, a spear, a quiver full of arrows, a bow, and a shield. As for the horsemen, they carried a bronze shield, 120 arrows, an iron mace, and two iron spears. For protection, the Immortals and other soldiers wore scaled bronze and iron armor that would glitter in the sunlight. This would increase their visibility when advancing on cities. How the Achaemenid army was usually formed was archers at the front, and to their sides were the cavalry. The archers were supported by light and heavy infantry. The first wave of attacks bombarded the enemy with arrows and men with sling shots would fling rocks, and later pieces of lead, at the enemy’s frontline. This would frighten the enemy, and then they were simply overwhelmed by the sheer manpower of the Persian infantry units. Due to the size of their army and military tactics, the Achaemenid Empire became the biggest empire of its time, spanning 3.4 million square miles. It extended from Anatolia and Egypt across western Asia, to northern India and Central Asia. In fact, it holds the record for highest percentage of the world population under its control. Out of the 112.4 million people alive in 480 B.C., 50 million, which is 44 percent of all humans on Earth, lived under the Achaemenid Empire. A favorite weapon of the Immortals was the Sagaris, which was a slender handled war ax. On the head of the ax, there was a traditional flat blade. But on the other side was a sharp point that could pierce iron and bronze armor. Since the ax was so light, it could be used with one hand, and it was usually swung overhand. Since it could be used one-handed it was popular for fighting in hand-to-hand combat, as well as on horseback. In fact, a Sagaris almost killed Alexander the Great at the Battle of the Granicus in 334 BC, which was the first battle between the Persians and the Macedonians. During the battle, Spithridates, a Persian commander, and his brother happened upon Alexander, who was on horseback. A fight ensued and Spithridates hit Alexander in the head with the ax, and it cut all the way down to Alexander’s scalp. When Spithridates raised the Sagaris again to deliver the death blow, one of Alexander’s men drove a spear through Spithridates, killing him. Alexander would go on to conquer the entirety of the Achaemenid Empire within four years of nearly being killed by the Persian war ax. 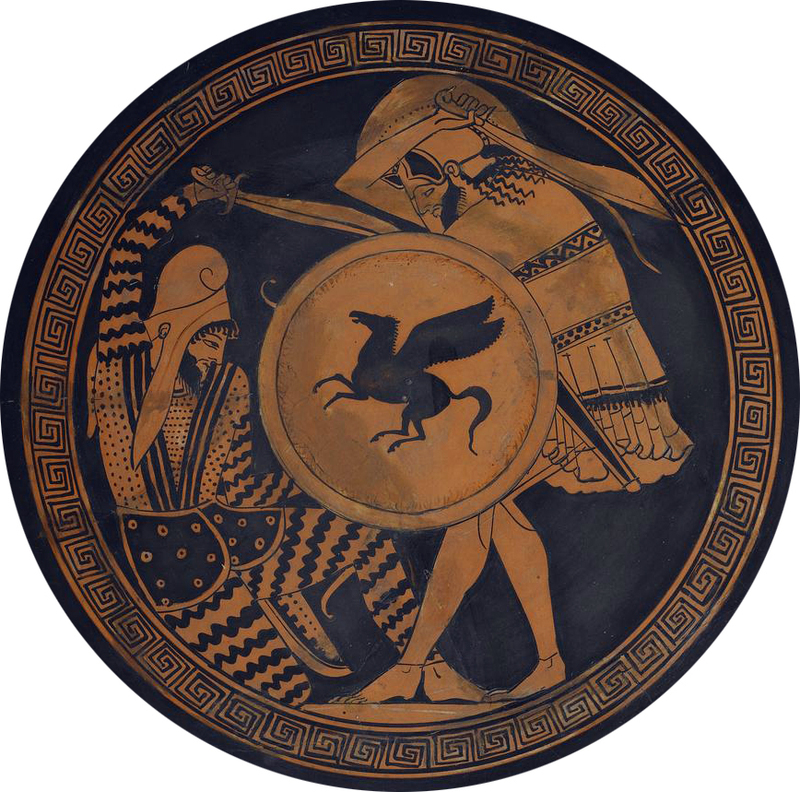 While often referred to as barbarians by the Greeks, the Immortals were more interested in psychological warfare than winning through force and brutality. One of their more famous uses of this psychological warfare happened in 525 B.C. during the Battle of Pelusium, and it is believed that it all started over a woman. Supposedly, Emperor Cambyses II of the Achaemenid Empire wanted to marry the daughter of Amasis, the Pharaoh of Egypt. Amasis was worried that his daughter could become his concubine instead of his wife and didn’t want to hand over his daughter. Instead, Amasis disguised the daughter of the previous ruler and sent her in place of his own daughter. When Cambyses discovered the fraud, he decided to take over Egypt. Before attacking them, Cambyses hatched a plan based on the fact that he knew that the Egyptians worshiped cats, specifically they had a beloved cat goddess named Bastet. Cambyses ordered his men to paint cats on their shields. When they went into battle, they had herds of cats walk in front of them. Supposedly, some Egyptian soldiers refused to fight and were slaughtered. 50,000 Egyptians in all were killed in the battle, while the Persians only lost 7,000 men. It was a decisive victory for Cambyses and the Persians easily took over the city. Cambyses installed himself as Pharaoh.